The final home of Mutual Benefit Life in Newark had 839 operating windows and 18 office floors. The Mutual Benefit Life/MBL Assurance Co. was a business and insurance giant in Newark for more than a century and a half. Founded in 1845, Mutual Benefit called Newark home until June 1999. During its long history, it was led by 10 presidents and located in six different office complexes. The last four were among the finest structures of their era. The company's rise was gradual, eventually producing one of the blue chip members of the national insurance industry. The company's fall is generally acknowledged to have taken place over two decades due to a number of circumstances. For nearly two centuries, insurance has been part of Newark's commercial life. Although it is no longer the nation's third-largest insurance center as it was earlier this century, it still can boast of being home to the world's largest insurance company, The Prudential Insurance Company of America. As early as 1810, the city was the home of the Newark Fire Insurance Co. When old Arch Gifford's tavern at Broad and Market streets was burned out, the losses were covered by insurance, a point driven home to others who had no insurance. In the city's early days, New Yorker Robert L. Patterson, a Manhattan merchant, went to England to learn more about the British insurance industry and brought back information about 'how to establish a company.' While Patterson interested New York capitalists in creating an American company, he was unsuccessful in his bid to obtain a charter from the New York Legislature. He then turned to Newark, where he was warmly received by both business and governmental officials. On March 6, 1845, Patterson met with Lewis C. Grover to discuss the formation of an insurance company with Thomas B. Segur, Charles S. Macknet, Henry McFarland, William M. Simpson, and Marcus L. Ward. His argument was successful, and Mutual Benefit became one of only a handful of American companies selling insurance. The Presbyterian Ministers Fund, organized in 1759, and two other companies established between 1759 and 1845 made Mutual Benefit the nation's fourth insurance company. Patterson's tenure marked a gradual development of the company. Upon his death, there were 8,000 policy holders with insurance valued at $26,140,051. Patterson was followed by Lewis C. Grover, who was president until 1881. He was succeeded by Amzi Dodd, 'one of the most remarkable men in Newark's history.' The Newark Sunday Call on March 29, 1936 said, 'He possessed not only the intellect of the scholar, the clear perception of the lawyer and the discriminating accuracy of the mathematician, but in addition to these qualifications he possessed to a remarkable degree the moral acumen which discriminated unerringly between right and wrong, between the true and false and between the real and apparent. Great was his service to Mutual as a mathematician, a lawyer and an executive, yet it was in the still greater service of character building that he made his largest contribution. In this field he has had no superior.' The principles of equity and of justice, which Dodd set forth with such unusual clarity, have been of incalculable value not only to Mutual Benefit but to the great cause of life insurance. In addition to his insurance work, he served on the Court of Errors and Appeals, and was the first vice chancellor in New Jersey. He retired in 1902, but continued working until his death in 1913, being connected with the Benefit for more than 50 years. Frederick Frelinghuysen followed Amzi Dodd as the company's head. His family almost needs no introduction since it has been involved in New Jersey and Newark politics from the 1700s. Frederick Frelinghuysen not only guided the destiny of Mutual Benefit but was elected president of the Howard Savings Institution and helped guide the two institutions through difficult times, including World War I and the influenza epidemic of 1918. John R. Hardin became president in 1924, giving up a lucrative law practice. Under Hardin, the company moved to the great Marble Building designed by famed architect Cass Gilbert, a building which many looked at as the city's most beautiful commercial structure. Yet as Mutual Benefit continued a steady growth, even the most beautiful commercial structure in town was replaced by the great classical building on Broadway. Once again the Benefit was to move, this time 'uptown' in a surprising and dynamic shift from the center of town, done during the Hardin years. John S. Thompson followed Hardin as president. He was followed by H. Bruce Palmer. By the time the 1980s arrived, the country had changed, as well as the city and state. Mutual Benefit's next two presidents were challenged as no others. Their lot was to progress while surviving troubled waters. After the rich 130-year history of the company, problems were beginning to surface. The collapse that occurred in 1991 did not happen overnight and can be attributed to no one individual, making the failure of the 18th largest insurance company in America, a linchpin of Newark's commercial heart, rather hard to believe. A Star-Ledger article on June 7, 1992, concluded that the great company had fallen because of 'questionable management practices, investment decisions and sweetheart deals,' a bitter pill for those who loved the company, a frightening experience for those with threatened funds and personal security, and a blow to the financial community. Specifically, the failure was due to taking higher risks on real estate portfolios, failing to develop proper management control with the company's 6,000 loans and overinvesting $630 million in luxury Florida condominiums. In short, the capital base was too low to support levels of risk while expense appeared uncontrolled. At the state level, too-lenient legislators and slow-moving insurance regulators failed to halt the company's demise. Worst of all, sloppy record keeping and lax management controls of the company, killed the company. According to The Star-Ledger, almost everybody involved with the company, from inside management to outside regulators, were negligent in exerting financial checks and balances. News of the company's overinvestment in real estate brought a run on the company similar to the rush on banks in the Great Depression. Drastic measures were taken to stem the tide, but it was simply too late. To protect policy holders, the fourth oldest, 18th largest, one of the nation's most-respected insurance companies was taken over by the state of New Jersey. Mutual Benefit's last executives, Robert Van Fossan and Henry E. Kates, captained the ship as it began to sink and took the blame for its demise. Von Fossan, Mutual Benefit's president and chairman from 1972-79, was 'remembered affectionately as intelligent, hardworking and energetic.' As one of the youngest life insurance company directors in the country, he was known for hefty commitments of time and energy to charitable, cultural and civic activities that made him one of the state's most prominent business leaders. According to a 1992 article, Van Fossan's worst fault was 'surrounding himself with sycophants – what he needed (was) a good financial man with conservative investment sense, and an expert at administration.' His sudden death, from cancer contracted in his early days working in a smelter plant, left the business, civic, and cultural community shocked. Kates, from Rhode Island, also kept himself at the center of power. Smart, hard-working and 'alternately charming and intimidating, (he) was one of the company's most aggressive, entrepreneurial agents,' according to a Star-Ledger report. In 1991, Mutual Benefit passed into receivership to prevent a run on its assets, to the amazement and anger of many policyholders. By December 1996, the firm had rebounded from fiscal collapse and the company was renamed MBL Life Assurance Corp. By 1996, the Benefit, which was $1 billion in debt, had again begun to grow and prosper. On the eve of the run on the company, it had 700,000 customers and $14 billion in assets. Nevertheless, rumors of its financial condition worried policy holders, and the end was at hand. Early in 1998, Mutual Benefit was sold to a California financial company, Sun Life. In August 1998, its new parent company was sold to the American Insurance Group. In 1999, the Broad Street headquarters building was acquired by a Florham Park-based real estate and development company, the Kushner Company operated by Charles and Murray Kushner. The new owners of the building are large holders of suburban apartment developments in New Jersey, New York, Pennsylvania and Florida as well as the famous Puck Building in Manhattan. 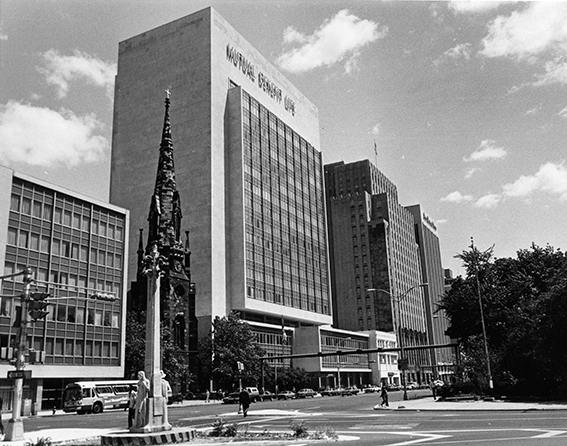 One of Mutual Benefit's legacies to Newark is the buildings it built during its lifetime. Its first headquarters was rented, but by 1847, business increased sufficiently to appoint a committee to investigate the construction of its own building. The office building was constructed on the northern side of Market Street between Broad and Beaver – three stories, of fire-safe brick with a roofline that included a pediment and flagpole. Other than this, little is known about it, nor have any illustrations survived. The architect may have been Stephen Grover Gould. At first, this building was large enough to have had rental space, a meeting room or public area that was used for hire. But more space was soon needed, and in 1858 a committee was appointed to acquire land for a larger building. The Bolles property was acquired for this purpose. When the second building was completed, it was considered one of the finest commercial properties in Newark. Four stories high, it was constructed of locally quarried Belleville brownstone and resembled a fortified castle. It basically had all the characteristics of a medieval English structure in a Sir Walter Scott novel. The first floor included three large windows, permitting a clear view of all business transactions. Its builders were G. B. Buerin and William H. Kirk and Company. Newark's nationally-known furniture maker, John Jelliff, produced some of the interior decorations. The Newark Daily Advertiser of September 1861 described the structure at Broad and Clinton streets as elegant, 'a great ornament to our city. The counting-room of the company is handsomely finished and provided with furniture of a superior make.' In April 1862, the prestigious publication the American Life Assurance Magazine, called the building 'an imposing spectacle of substantial grandeur and refined architectural beauty; reflecting alike honor upon the state and mechanical skill of the architect who planned and the mechanics who executed the work.' This building remained Mutual Benefit's home for the next 42 years. The third home of Mutual Benefit was 'The Marble Building,' completed in 1904 at the same location as the previous building. Two architects were invited to submit plans for the structure, George B. Post and Cass Gilbert. Post, architect of the great Romanesque-styled Prudential offices across the street, was selected for the position. Gilbert's designs were not accepted, but he was compensated for them. ''The Marble Building' was built in three stages. Knoxville marble was used for doorsills and floors. Vermont marble was placed in the directors' room. The exterior was sheathed in South Dover marble. Decorative features including lions' heads, swags, crown modillions, friezes, pilasters, columns, keystones and consoles. The building's metal work included bronze friezes, candelabra, balustrades and decorative posts. Woodwork was of spruce and oak. Completed in 1908, the building of modified Renaissance style immediately became the city's newest landmark with its four free-standing columns topped by large and handsome Corinthian capitals. Years later, when 'The Marble Building' was being demolished, one of the columns was sent to the University of Michigan to be set up in the college garden. With the construction of its present and last home office at 520 Broad Street, the company again became a major downtown presence. The 20-story skyscraper had 485,000 square feet of floor space. Its architects were Egger and Higgins. The contractor was George Fuller. The last home of the insurance giant had 839 operating windows, 18 office floors, and subsurface snow melting coils in sidewalks and driveways. It was made from 123,279 square feet of Alabama limestone, 150,000 pounds of aluminum, 28,000 square feet of heat-absorbing glass, 5,600 recessed lighting fixtures, and 8 million feet of wire and cable in electrical systems. Designed as the home of 1,000 employees, the new showcase contained high-speed elevators, grid-pattern fluorescent lighting, and a pneumatic tube system for the transport of paper files within 40 stations scattered throughout the structure. On moving day, 16 trucks and 250 men worked continuously for 48 hours until the new building was ready for occupancy. Milford A. Vieser, financial vice president noted, 'This will be the most modern and efficient office structure in the state.' It was, and it served well!